Troubleshooting the "Missing from Quickbooks" conflict. This article will focus on the conflicts listed in Missing From Quickbooks. In most cases, the reason anything is shown in this grid is due to how your Transaction History is set in Method's QuickBooks preferences. In fact, conflicts here may be the intended behaviour and there is no need to resolve them. It depends on your needs and whether or not you need the past transactions in Method. When you go to the Gear > Preferences > QuickBooks screen, under the Advanced section, you will find your setting for the Transaction History. In the above image, Method will keep closed transactions for the past 31 days. All other transactions are still in QuickBooks, but they are not synced to Method. This is helpful due to the number of transactions generated over years of being in business. On a day-to-day basis, you don't need to access these transactions. However, the conflicts that show up in Missing From QuickBooks are due to transactions which are outside of the transaction history date set. 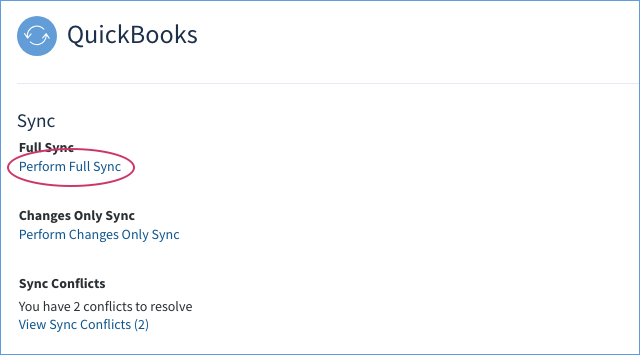 Again, in the above example, if you have a closed transaction more than a month in the past, it is considered archived and will not sync from QuickBooks to Method. Fortunately, this is easy enough to resolve. 1. Navigate to the Gear > Preferences > QuickBooks. 2. Expand the Advanced section and change the transaction history to a more appropriate date. You can set the history settings for separate transactions individually by selecting Edit history settings per transaction type. 3. Scroll to the bottom of the page and hit Save. 4. Scroll to the top of the screen on the same page and hit Perform Full Sync. 5. If your sync conflicts still occur, perform the Full Sync again.